Similar to T158723: Show a different tooltip on the visual mode switch button when it's disabled the new dropdown to switch editing mode should show a different tooltip if no switch is possible. 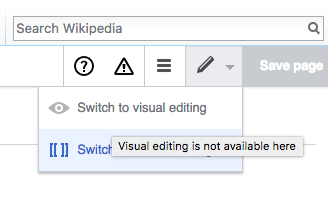 Currently it tells you just "Switch editor", even if only the one option is available because you are in a wikitext-only namespace. (i.e. disabled, so shown as the regular tool but greyed-out, and with a different tool-tip) – which is that for which this task is asking, I think? However, I thought you were talking about the label for the current mode, which currently says "Switch to …" even though you're in it. Should we re-name? I mean the tooltip shown for the pencil icon, which is shown before you open the menu, so you don't have to open it just to see that you can't switch the mode. Or (don't know whether this has been discussed before) add a third option to the dropdown: "Abort editing" (which currently is available only via the Esc key or by clicking the "Read" tab) This would make sure that there always is more than one usable option in the dropdown. I think if you have gone as far as hovering on the pencil tool for the required timed to get the tooltip to display, it's not much more effort to click it. Also putting the message there would be inconsistent. Jdforrester-WMF set the point value for this task to 0. Theoretically we could show the "editLock" icon (full list) but I don't think that'd help users enough to be worth the complexity/additional slowness.